Protesters demand more government action against gun violence, Aug. 2, 2018, in Chicago. Protesters seeking Thursday to draw attention to the problem of gun violence in Chicago briefly shut down the city's famed Lake Shore Drive, which runs along Lake Michigan. 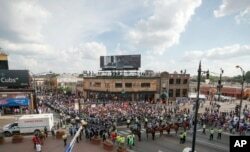 The Chicago Tribune reported that while the protest was not large, about 200 marchers achieved their aim of disrupting traffic for thousands of motorists. Organizers said they were marching to demand the resignations of Police Superintendent Eddie Johnson and Mayor Rahm Emanuel for failing to lower gun violence. Protesters arrive at Wrigley Field to demand more government action against gun violence, Aug. 2, 2018, in Chicago. Organizers said they brought the protest to the heart of the city's more affluent enclaves to "redistribute the pain" of gun violence and economic blight plaguing some of Chicago's black and Latino communities. The protest came during a busy tourism week for Chicago, with the annual Lollapalooza music festival starting Thursday. The Reverend Gregory Livingston, one of the march's lead organizers, called on the festival performers to stand with protesters and cancel their performances. But none of the artists appeared to comply. Chicago has recorded more than 300 homicides so far in 2018, more than any other U.S. city, but a 23 percent decline in killings compared with the same time last year. Will Parkland Student Activists Define Post-millennial Generation?